One of the treasures of the Thoresby Society collection, which has recently been transferred to Leeds Museums and Galleries, is this Leeds City Police badge. It is of interest in its own right as it is the design worn by the police shortly after Leeds gained city status in 1893 and probably dates from about 1895. This photograph was taken by Sara Porter for Leeds Museums and Galleries and is licensed under Creative Commons BY NC SA. 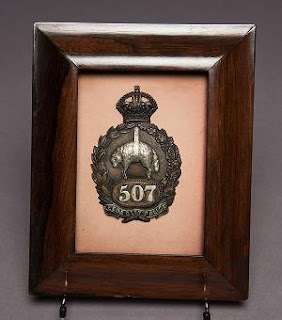 I have the honour to enclose herewith a badge belonging to one of your Force which was found on a native here on the borders of French Haut-Senegal and Niger. It was on a policeman’s helmet which he was wearing, and which he stated he had bought in Coomassie market. We are strict here in not allowing the natives, except those employed by the Government, to wear badges etc. as they impose on the raw savages up here, and loot under the guise of being in the Government Service. I presume the helmet must have been sold in a pawnshop, but I thought the badges were always taken off. I have seen in a small trading store in Northern Transvaal a London and N.W. Railway guard’s frock coat for sale with the company’s buttons still attached. We only hope that the gentleman concerned was not punished too severely for this transgression and was allowed to keep his hat (minus the badge). Dragon Ball Z comes to Leeds Museums!